Saturday 14th July – Our Summer Concert Women in Songwas performed to a packed audience and received much acclaim. Our guest artist was the well-known local soprano Fiona Weakley and she performed a wonderful selection of songs from Gershwin, including a spine-tingling Summertime. ‘Many congratulations on the splendid concert on Saturday, 14th July. We enjoyed it very much and it was good to see such a good turnout. On the 1st of December we sang at Embleton Village Hall, for St. Cuthbert’s Church, Embleton Annual Carol Supper. This is steadily becoming an annual event and the choir certainly enjoy singing there – not least for the lovely supper we are provided with! 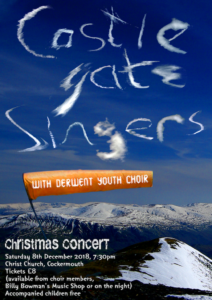 Our 2018 Christmas Concert welcomed Derwent Youth Choir and we performed a selection from Rock Nativity with them. There were lots of other great items on the programme from classical to popular – all on a Christmas theme – naturally. This was also our final concert with our Choir Director Val Hetherington who has been with the choir for a long number of years – as a singer, accompanist and finally Director.